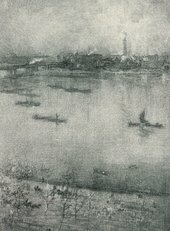 Whistler returned to London from Paris in 1896, seeking medical treatment for his wife, Beatrice, who was dying of cancer. His experimentation had now moved from painting to printmaking. From their rooms on the sixth floor of the new Savoy Hotel, on the north bank of the Thames, he worked on a series of lithographs of the views of the river below. Imbued with melancholy, these delicate prints were to be the last representations he made of the river he loved so much. The Thames held the same fascination for Monet as it had for Turner and Whistler. In three successive years, between 1899 and 1901, Monet resumed his artistic dialogue with the city in which he’d sought refuge from war thirty years earlier. Now, his central concern was to paint views of the Thames showing the effects of fog.